As some of you already know, I and my colleague Tomas Petrasek are currently at the European Planetary Science Congress in Nantes, thanks to the Department of Geophysics of the Charles University in Prague, which enabled us to attend. It’s been a busy few days so far, so I barely had time to even tweet anything about it, but I decided to at least quickly summarize a few of the highlights so far. I apologize for only providing this short summary in English but Czech readers can look forward to a whole series of articles by me and Tomas, some of which may not be fully available in English, so the wait should be worth it! Colin Johnstone had a really interesting talk about stellar winds and high-energetic radiation environment in the vicinity of fast and slow rotating young stars. His team is also looking into possible evidence of whether the Sun was a fast or slow rotator pre-main sequence, which would have influenced the system’s evolution – planetary atmospheres (which highly depends on whether the planets were formed already in this short phase) and the development of the protoplanetary disk itself. His colleague Kristina Kislyakova is also starting a research into the properties of habitable zones around different types of stars, including those out of main sequence like white dwarfs. They’re both from the University of Vienna. In February 2016, the Pathways to Habitability conference is going to be held there. You certainly all heard the interesting news about the recurring slope lineae on Mars, which was presented on the congress and in the NASA press release on Monday. We’ve briefly talked with Alfred McEwen today about the history of Martian water, role of perchlorates and other salts and the possible origins of Martian gullies, which are not to be mistaken with RSLs but could have a similar origin with water condensing from the atmosphere. Tjalling de Haas has studied the gullies and concluded that such source is most likely to explain their properties, which raises the question of past Martian environment dependent on the axial tilt – if it was higher recently, the CO2 polar caps may have sublimated more, resulting in a denser and slightly warmer atmosphere and allowing for more water vapor in the atmosphere. His talk comes on Thursday, we’ve just briefly discussed it so far. Another process contributing to the gullies, based on cracking of CO2 condensed ice and escape of trapped gases, was proposed here on Monday by Pilorget and his team. This is just a tiny snapshot (and I’m not even going into the history of the difference between the hemispheres) – more articles to follow! We have shortly talked with Matt Taylor and Patrick Martin about the Rosetta mission. To very briefly summarize the recent news, the activity around perihelion was even higher than expected, including the very large diamagnetic cavity after one of the big jets, and the surface changes seem to be quite large – but we’ll know more about them as Rosetta goes into a closer orbit again. That also means that during the next few months, it will come into the cone of communication with Philae and will be sufficiently close. If Philae is still active, we may hear more roughly until the end of this year, hardly later. Lots of interesting talks about the icy moons of the solar system. Baptiste Journaux presented a model of convection in high pressure ices (based also on experimental data on their saturation with salts), which may have big relevance especially for Ganymede and Titan. I’ve only had time for one question about dissolved gases but may catch him for a few more questions later – there will certainly be articles about the icy moons, especially as we discussed them with Gabriel Tobie. Tobie’s and Choblet’s team is also presenting their own model of high pressure ices and the chemical exchange between them and the rocky mantle on Friday. Klára Kalousová is presenting her model of water accumulation below Europa’s strike-slip faults tomorrow. And the talks about Titan were really frequent here. Impossible to completely summarize now, it’s after midnight here and I’m exhausted. More articles to come! A few isolated remarks: The possibility of lightning features in Saturn’s ring and interesting approaches to their dynamics (our talk with Larry Esposito). Tribocharging as a mechanism possibly playing a role in ring processes. Could it play a role in clouds and hazes? I asked the author, Scott Waitukaitis, about it, and he thinks it’s entirely possible but we’re lacking data. Will try to look into this in more detail. We’ve by now got hours of interviews about Mars, Venus, icy moons, planetary rings and more exciting topics, building upon the news presented here. (Also some anecdotes about citing Darwin, big scientists as Star Wars fans and the benefits of free food!) It may take a while before we can process it all. Another brief highlights article will follow during the weekend, the rest gradually in the following weeks. Stay tuned! Yours truly, tired and excited faithful observer. P.S. : Tomas will have a popular science article about rogue planets in the upcoming issue of Clarkesworld. Check it out! 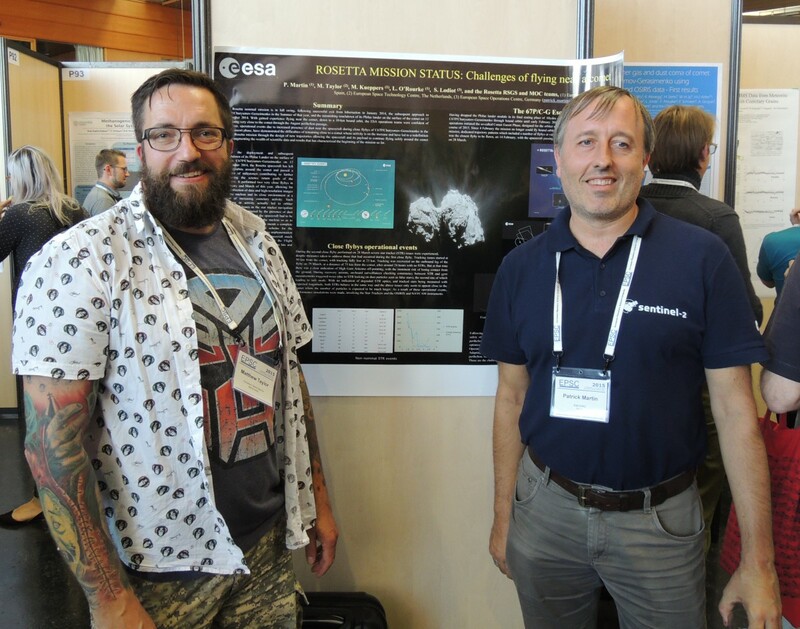 Matt Taylor and Patrick Martin in front of a Rosetta poster. Photo by Tomas Petrasek.